We have sanded the canoe to death. All the curves look smooth and we are getting to the point where sanding the canoe any more will just put dips in the wood between the mould stations and between the harder and softer parts of the cedar strips. Paul and I remove all of the strap holders from the station moulds. 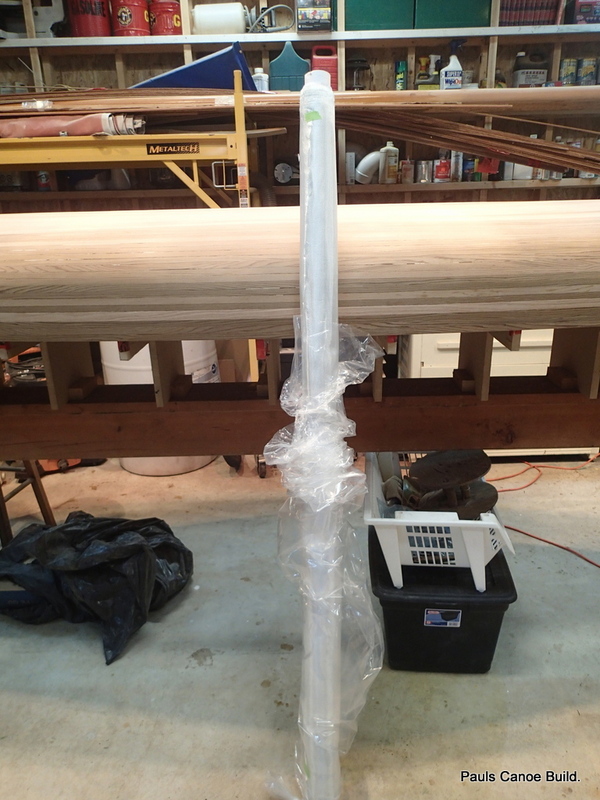 The cloth must be able to hang off of the canoe without any interference. Last chance to fix any problems. You can see our temperature gauge on top of the Canoe…16 degrees Celsius. My garage is unheated. 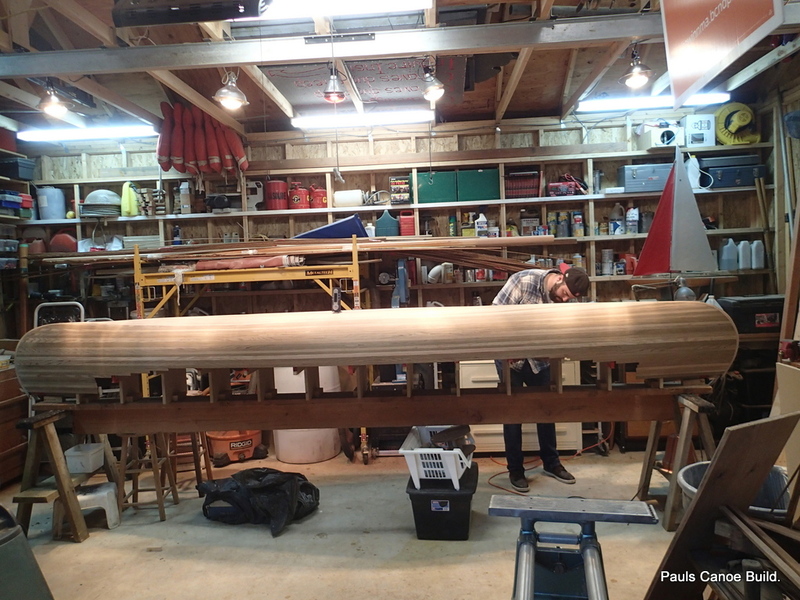 We use five heat lamps and two heaters to warm the Canoe. 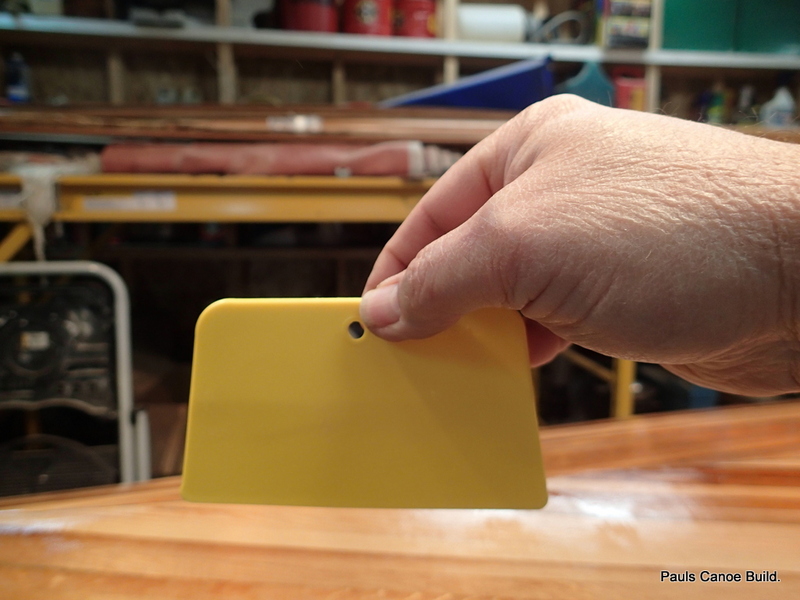 I have had “Off-Gassing” or bubble problems in the past…on bare wood, usually caused by a rise in hull temperate after the epoxy has been applied onto the boat. 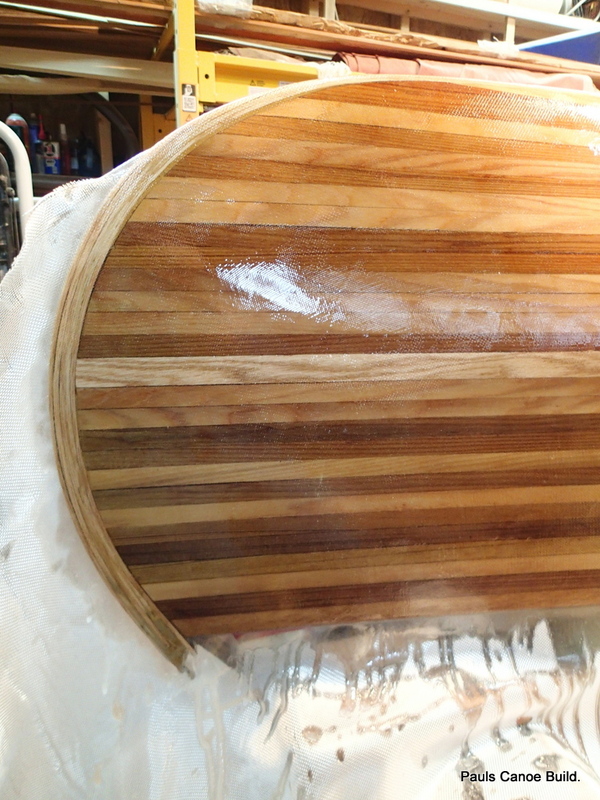 I now only epoxy over bare wood when the temperature of the boat will not increase during the cure time. 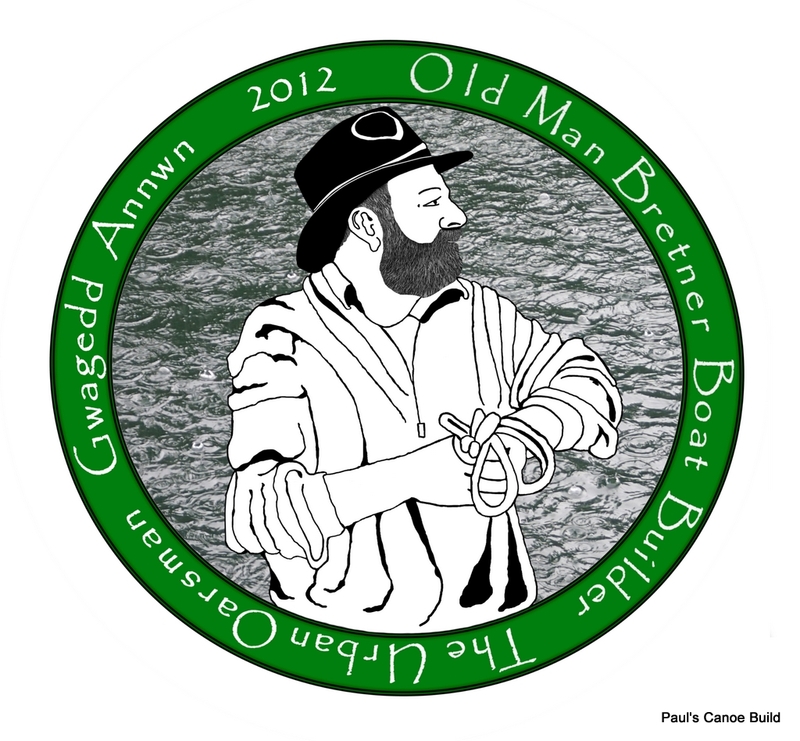 Paul and I roll out the cloth on top of the Canoe. 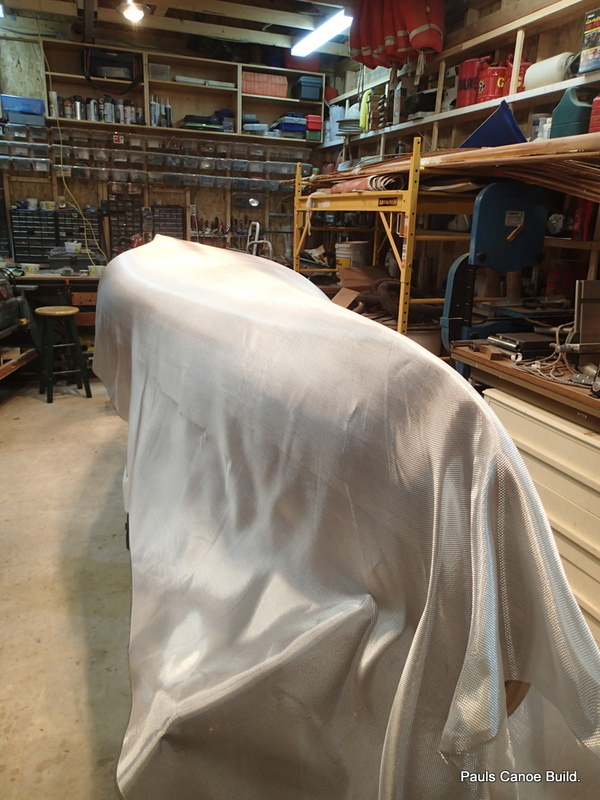 Cloth draped over the Canoe. We adjust the cloth, pulling it gently to the North, making sure that the cloth is smooth and even. We use a paint brush to move the cloth…Our hands leave wrinkles. 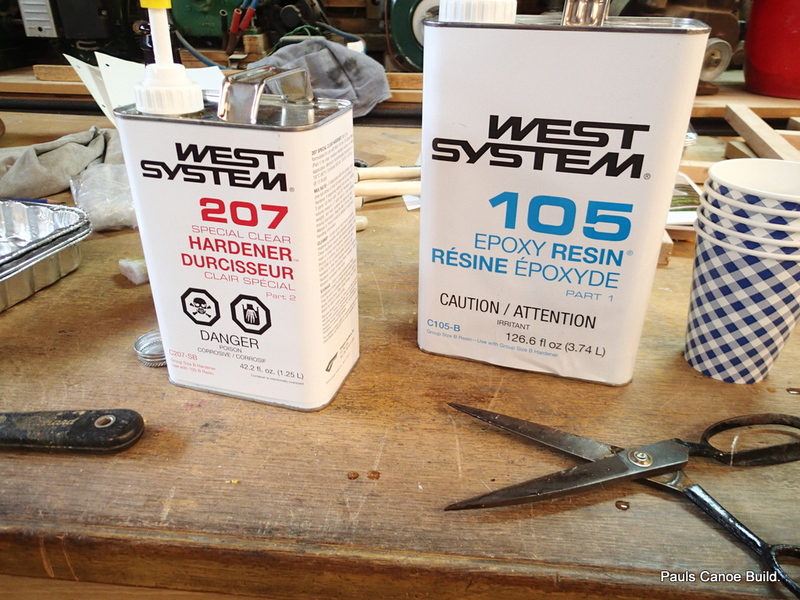 We cut the cloth at the stems.We mix up five pumps of epoxy resin and five pumps of hardener into a cup. Stir with a tongue depressor two hundred times. Pour onto canoe. I spread the resin along the Canoe. 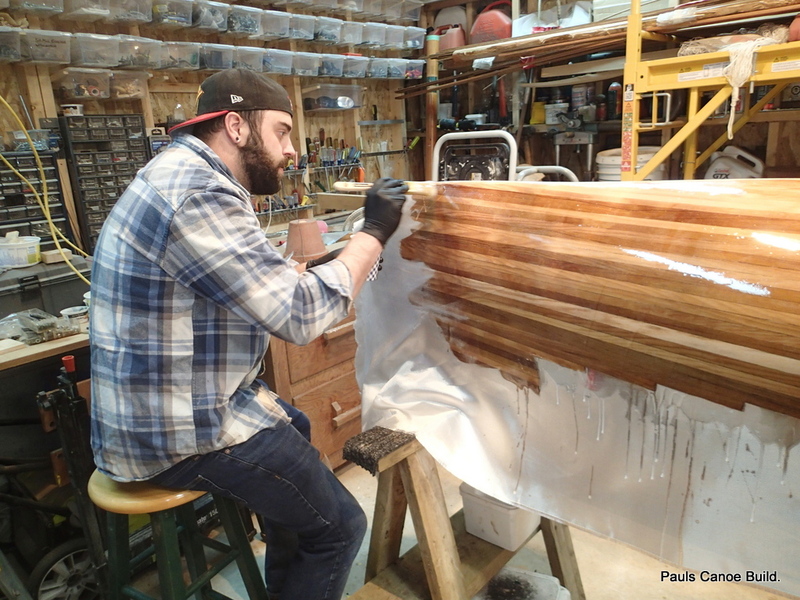 Paul puts the resin on and I spread it out using the Plastic spreader. 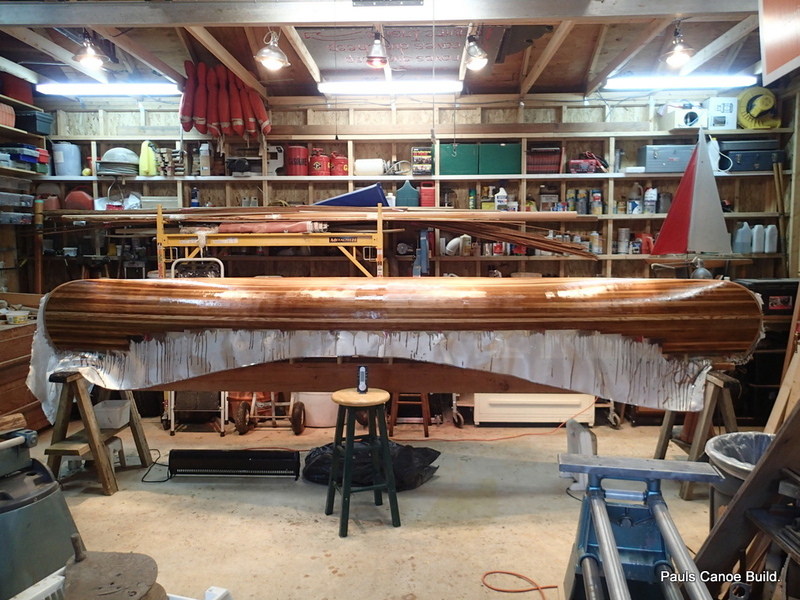 We apply about ten cups of five pumps of resin to wet-out all of the cloth on the canoe. We are working in low temperatures. We have a pot life of over an hour. When we have gotten all of the cloth saturated and given the resin time to soak into the cedar, we begin to scrape off the excess resin. The goal is to see the weave of the cloth. 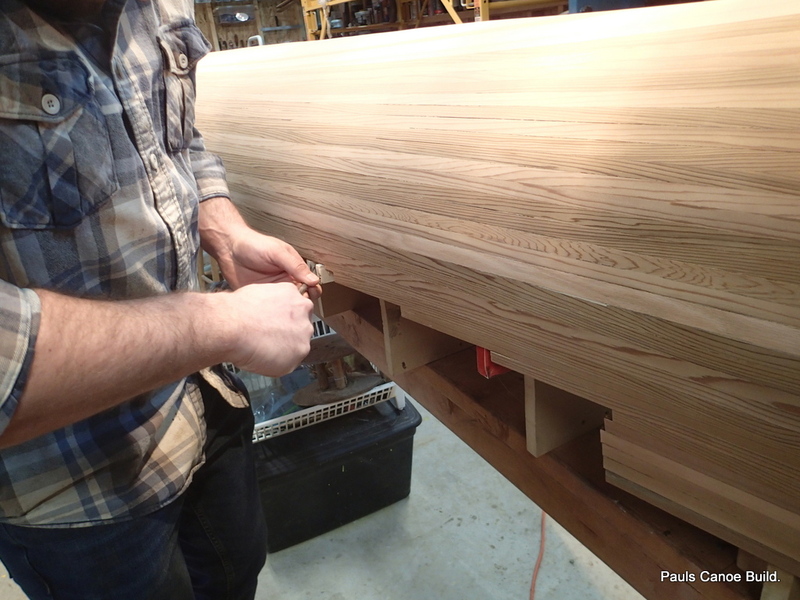 We go over the Canoe three times, scraping off the excess resin. 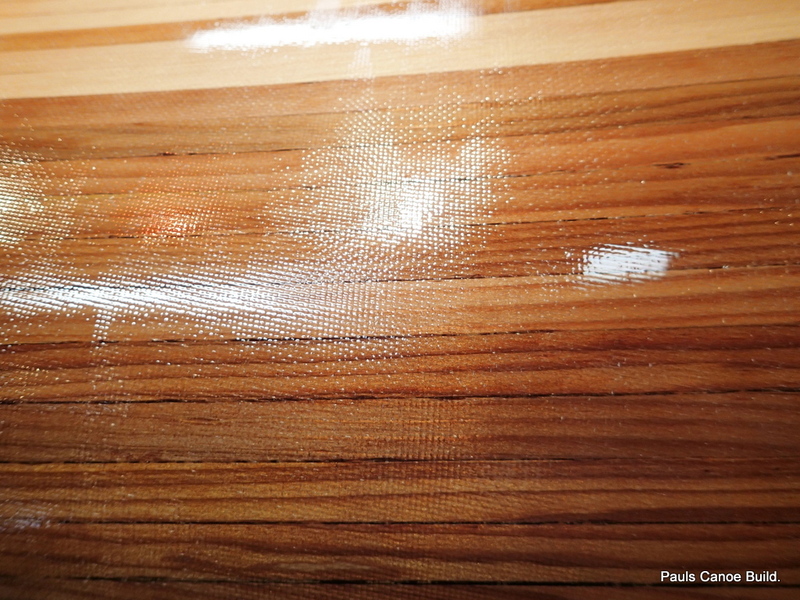 You do not want the cloth to “float” in the resin….You also do not want the cloth to be “starved” for resin because the wood has absorbed too much. North stem, West side….Looking good. You can keep doing the scraping until you go mad….or decide that it is good enough. Looks good enough to us! We are done by noon. 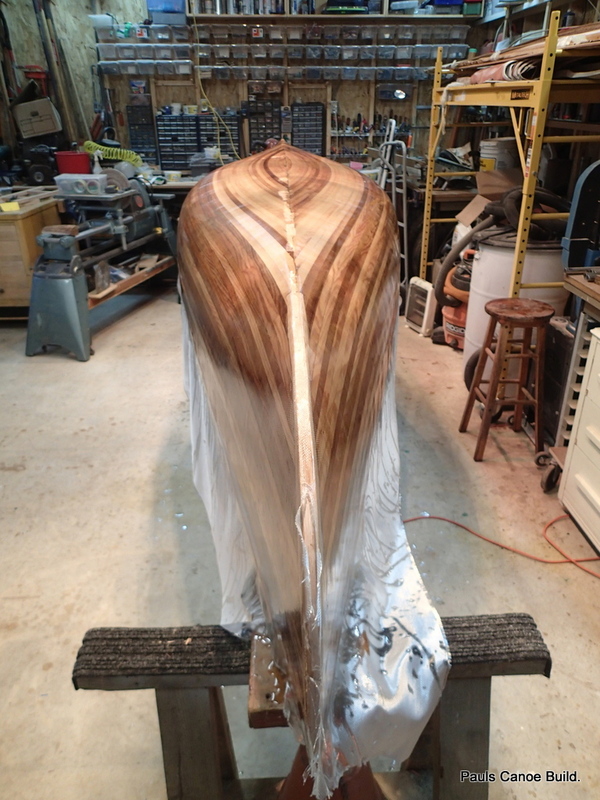 Time to let the epoxy cure…Then another coat, a “fill” coat. The epoxy is “dry” to the touch by 7pm. Time for that “fill” coat…….